The top seeded ’06-’07 Ducks held a 3-1 lead after the first period of Game 1, but the 3rd-seeded ’05-’06 Mighty Ducks chipped away until Chris Kunitz tied the game for them late in the third period. His goal forced overtime and then almost four minutes into OT, Teemu Selanne scored to give the top seed a 1-0 series lead. Then, in Game 2, it was the ’05-’06 Mighty Ducks that held a lead until late in regulation. Andy McDonald scored with just over a minute left to tie the game, 2-2, for the top seed and force overtime. Just like in Game 1, Game 2’s OT didn’t last long as defenseman Scott Niedermayer scored just over two seconds into the extra period to give the top seed a 2-0 series lead. 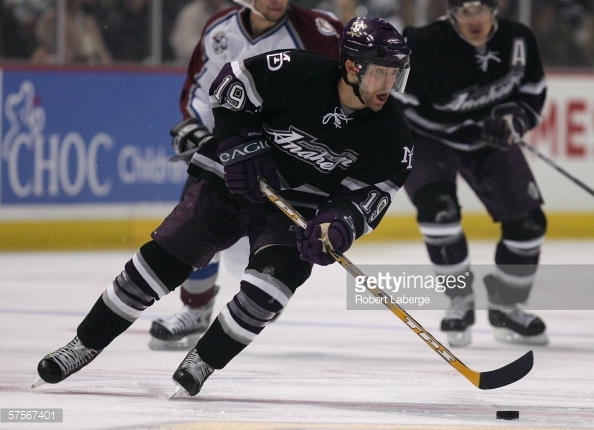 Game 3 was tied heading into the third, but defenseman Francois Beauchemin broke the tie 4:10 into the third, which became the game-winner for the ’05-’06 Mighty Ducks. Then, in Game 4, Corey Perry potted home a rebound four and a half minutes into the second period to give the top seed a 3-1 lead. However, in a span of about two and a half minutes later in the period, the ’05-’06 Mighty Ducks tied the game, 3-3. That remained the score until when Jonathan Hedstrom scored almost nine minutes into the third to give the ’05-’06 Mighty Ducks a 4-3 lead and they held on to that lead to tie the series up 2-2. Then, a little over nine minutes into Game 5, Andy McDonald scored to get the ’06-’07 Ducks on the board first. The ’05-’06 Mighty Ducks tied the game late in the second period thanks to a Selanne PP goal. Regulation would end tied 1-1 and it would remain that way until almost four minutes into the SECOND overtime when Rob Niedermayer gave the ’05-’06 Mighty Ducks a 3-2 series lead. The ’05-’06 Mighty Ducks sealed the upset win with a dominant 5-2 win in Game 6 and McDonald led the way with a hat trick. Therefore, we have a rare occurrence of a Cup-winning team not making the Ultimate NHL Playoff. The ’05-’06 Mighty Ducks of Anaheim are the 33rd team to qualify for the upcoming 2015 Ultimate NHL Playoff. It will be their first trip to the tournament and they are the 13th team that will make their debut in the upcoming 2015 Ultimate NHL Playoff. Up next is the 2015 Carolina Hurricanes Qualifying Tournament! This entry was posted in Qualifying Tournament, Ultimate NHL Playoff and tagged Anaheim Ducks, Andy McDonald, Chris Kunitz, Corey Perry, Dustin Penner, Francois Beauchemin, Jean-Sebastien Giguere, Joffrey Lupul, Jonathan Hedstrom, Mighty Ducks of Anaheim, Qualifying Tournament, Rob Niedermayer, Scott Niedermayer, Teemu Selanne, Ultimate NHL Playoff. Bookmark the permalink.